Deluxe Son-Ray Blinds’ entire range of wood and wood-look Venetian blinds come with an attractive fascia on the top to cover the mechanics of the blind and give it a streamline appearance. MikronWood Blinds are a composite Venetian blind which gives you the appearance of wood with the durability of a laminate. They are available in 50mm or 63mm widths. TimberStyle Blinds have the color and texture of wood blinds, however their production makes them very suitable for wet areas such as kitchens and bathrooms as their polymers are more resistant. It is a great low-cost product suitable for use in homes and businesses. It is stylish enough to be used in bedrooms and living areas, and tough enough to last in the Bathroom or Laundry. 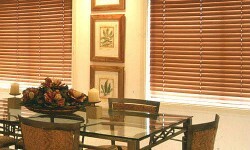 EcoWood is a durable, cost-effective option throughout the home or office. This plantation-grown Basswood Timber Venetian will give your room that finishing touch and style. Choose from a range of timber stains and painted finishes. 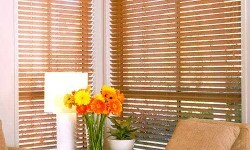 They are authentic wooden blinds made from Western Red Cedar. 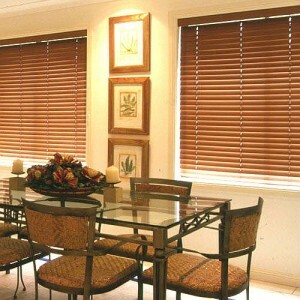 The range is available in 46mm slats, finished in tough UV resistant lacquer for sun protection, and offers a traditional, long-wearing effect.